Search For "Agriculture" Companies in Simpsonville, South Carolina - Click Here Now! Looking For A Professional Carpet Cleaning? Look No Further! We Service All Of The Upstate- Call Us Today! 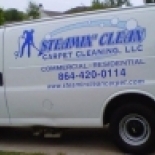 Steamin' Clean Carpet Cleaning, LLC in Simpsonville is a company that specializes in Lawn & Garden Services. Our records show it was established in South Carolina. Staples Contract & Commercial Inc.